More State of Disc Golf Survey Results — PDGA: Thumbs Up or Thumbs Down? When I first heard about the Professional Disc Golf Association (PDGA) I was excited to join. I had been playing for a few months and really enjoyed the feeling of camaraderie with the club, so I figured that joining the sanctioning body of the sport would have the same benefits, only on a larger scale. The idea of a ranking system intrigued me, too. How cool would it be to compare my ranking to my buddies’, or the touring pros? Plus, I would save the $10 fee charged to non-members when I played in a sanctioned tournament. I did join the PDGA, and have kept my membership current ever since. I’ve heard a lot of different opinions about the PDGA, pro and con, and have my own opinions that I will discuss later. I’ll also talk about a good, free alternative to the number one reason why people join the PDGA. But first, let’s look at the poll results. Let’s start by checking out our opinions on membership in the PDGA. We asked if you are currently, or have ever been, a member of the PDGA. Slightly less than half of us, 49.3%, are or have been members. While that part was not surprising, based on what I see in the sport, the next question had some interesting results. Of the 50.7% of us who are not members, nearly half of those said they intended to join this year. If that amount of people really do end up joining, that is an encouraging sign for the future of the sport. We didn’t ask why people plan to join, but I suspect they are interested in playing tournaments and want the savings and the ratings that come with membership. That means a growing number of us are taking the sport seriously enough to get involved in competitions. As I’ve mentioned on previous blogs, I like that idea. It’s always fun to see how long people have been members of the PDGA. Members with less than five-digit PDGA numbers are way outnumbered by the rest of us. 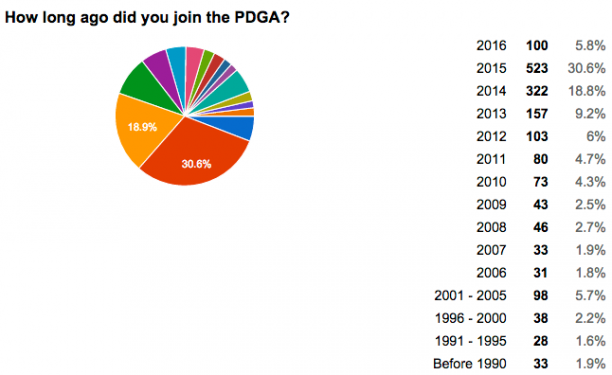 So, we asked people when they joined the PDGA. Over half of member respondents joined in the last two or so years (2014 to January 2016). The sport is growing! A little over 5% of us joined in 2000 or before. We asked people who are members to rank the different benefits of belonging to the PDGA. Not surprisingly, most people ranked the personal PDGA number and rating as the top reason for joining. That’s what initially attracted me. The second most popular benefit was the lifetime statistics. It is fun to see our results and compare our ranking to other people’s rankings. Rounding out the top reasons for joining the PDGA was waiving the $10 fee for sanctioned tournaments. What was the least important reason we join? Getting a discount at motels and car rentals was the least popular reason, followed by the swag you get the first time you join, then the quarterly magazine. On the other end of the membership spectrum, we asked people who indicated that they were NOT going to join or who were unsure, what their reasons were. Only little more than half of those people responded to the question, with many people giving multiple reasons. Far and away the number one reason for not joining was being content not playing sanctioned tournaments. The exact language of the question read, “I’m content playing recreationally”, but I believe that would include league play and unsanctioned tournaments. Nearly 70% of respondents chose that as at least one of their reasons. Plus, many people who wrote responses in the ‘other’ box had similar feelings about formal competition. The next two most popular reasons for not joining were lack of any noticeable benefit, and the cost being too high. A sanctioning body for disc golf is necessary in order to have consistency in rules and formats among players, clubs, and tournaments, and to grow the sport. I want to support that organization and will likely always stay current with my dues. However, like many of you expressed, it seems that my decision to keep current comes down to economics: I know that I will play enough sanctioned tournaments that the $10 savings from being a member will pay for my annual dues. Were it not for that “benefit”, I doubt I would be interested in renewing my membership in the PDGA. Don’t get me wrong, I like the stats and the rating. I just don’t think it would be worth the annual fee. This would be a good time to mention the Infinite Discs rating system. It is a free player-rating system that keeps track of your scores and rates both your individual rounds, and your accumulated rating based on the ratings of other users who have played the same courses as you. After you’ve played a certain number of rounds, then your rating is used to rate other players. The more scores that are entered, the more accurate the rating. The player rating system is free to join, free to use, and can be calculated automatically by using the free Infinite Discs scorekeeping app (currently in beta testing). Back to the PDGA. There are just a couple things I wouldn’t mind if the PDGA changed. First, I would like it if they could switch to digital magazines. Also, I wouldn’t mind if they stopped sending out yearly tags, ID cards, and whatever else we get on an annual basis. Perhaps these ideas might result in a slight reduction of annual dues. And finally, I would like to see a two-tiered membership option. Offer the regular membership, and one that is cheaper, but omits the $10 fee waiver at sanctioned tournaments. That way if people only play a couple sanctioned tournaments per year, they will still get their number and rating. Beyond that, I’m glad they will continue keeping track of people’s stats and ratings, and make sure the rules are as fair as possible. They won’t be able to please everyone, no matter what they do. But hopefully they will continue to offer an organization that strengthens and grows our sport. After seeing how they’ve treated Steve Dodge and the DGPT, I have no interest in being any part of that organization. Lots of great ideas coming out of that effort and all they want to do is squash it. Typical petty bureaucracy. The PDGA is so stuck in the past it’s pathetic. Unsanctioned tournaments have always proven to be more fun anyway-as well as less expensive. The PDGA is reluctant to fix the rules. Especially the step putt and jump putt. These are just methods if cheating regardless if you think this methods don’t help accuracy. They are both footfault and should be illegal. I was told the rules committee looked at it but couldn’t agree. The PDGA thinks they need video instant replay to determine if a player using these techniques dies footfault. Ridiculous just make them illegal. They can jump or step and land behind the lie like everyone else. Reminds me that in some Folf tournaments allow putters to have back foot at lie and step toward the basket as long as back foot is at lie. They are all just methods to shorten the putting distance.